Hakusan, Japan, September 27, 2016 – EIZO Corporation (TSE:6737) announced that both of its IP decoding monitors, the 23-inch DuraVision FDF2304W-IP and 46-inch DuraVision FDF4627W-IP, now support Axis Communications’ VAPIX protocol. 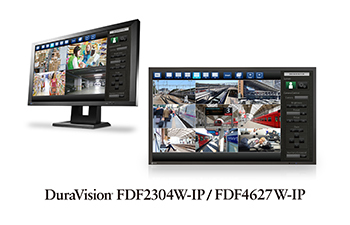 The DuraVision FDF2304W-IP and FDF4627W-IP are developed specifically for IP security and surveillance environments. VAPIX support broadens both monitors’ compatibility with Axis security cameras to ensure interoperability with a wider range of devices. It also enables new functionality with the monitors such as the ability to display IP camera video feed in corridor format (3 screens). Working closely with leading security camera manufacturers to support protocols for an increasing range of devices ensures reliable and efficient use of EIZO’s DuraVision IP decoding monitors in integrated security and surveillance systems. VAPIX is supported by IP monitor software version 4.1000.